File photo The Clothesline Project, which began in 1990, allows women affected by violence to share their story in a unique way — by decorating a shirt and hanging it on a clothesline. If you are a victim of domestic violence or sexual assault or know someone that is, contact your local police department or the Family Violence Prevention Center of Greene County. Do not close your eyes to the violence. If you believe that the abuse will stop without help, you are wrong. Statistics show that over time the abuse gets worse and more frequent. FAIRBORN — Community members and county leaders will “Take Back the Night” and support survivors of sexual violence 6 p.m. Friday, April 19 at the Fairborn Community Park Atherton Amphitheater, 691 E. Dayton Yellow Springs Road. Family Violence Prevention Center (FVPC) and the YWCA Dayton are hosting the event in an effort to raise awareness for sexual violence during National Sexual Assault Awareness Month. The theme of the night is “Our Voice is Our Power,” focusing on celebrating survivorship and using one’s voice to reclaim power from those who abuse it. The event will include speeches from local leaders and experts on sexual assault, art displays and a survivor Speak Out in which survivors can share their stories. The night will end with a glow stick vigil to stand in solidarity with survivors of sexual violence. The entire community is invited to attend this free event in its second year. For more information, volunteering opportunities, or to share a survivor story, call FVPC at 937-376-8526 ext. 124 or contact the Sexual Assault Response Coordinator at leah.stone@violencefreefutures.org. 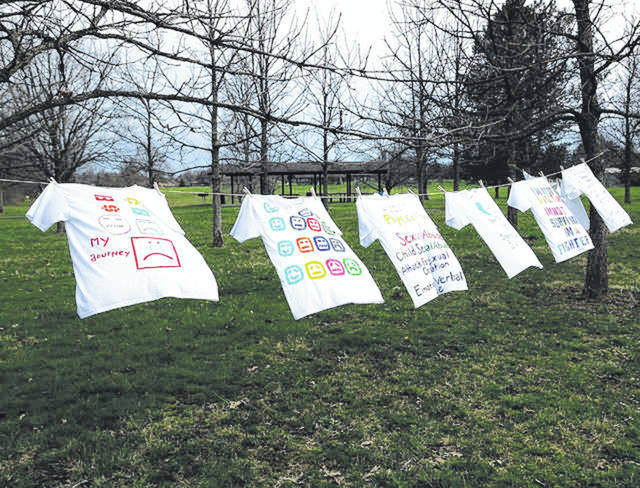 https://www.fairborndailyherald.com/wp-content/uploads/sites/50/2019/04/web1_Clothesline.jpgFile photo The Clothesline Project, which began in 1990, allows women affected by violence to share their story in a unique way — by decorating a shirt and hanging it on a clothesline.